To be honest, the challenges to stay healthy and not to add weight were some of our personal concerns before setting out on our travel adventure. 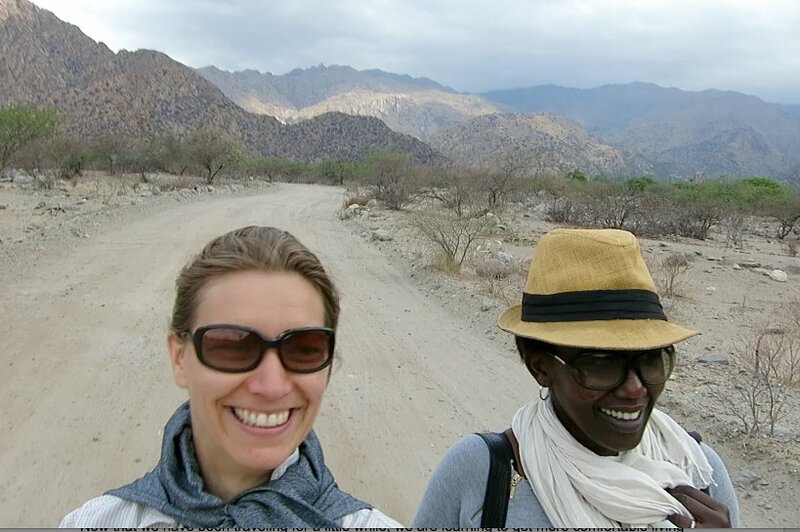 To help solve for the issue, Rosemary signed up to run the Buenos Aires marathon in October before leaving the U.S. to keep her and Claire on track (who is not running it but she is coaching Rosemary and also doing the training). In the twelve weeks or so that we have been traveling, we have adopted 5 habits that have worked for us and tips that we think can work for you as well. 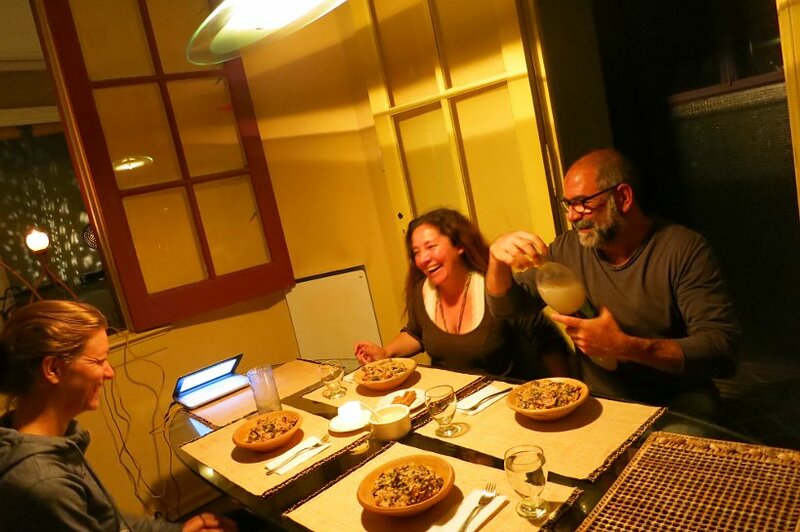 Whether it’s the excitement we wrote about previously of tasting llama meat in Tilcara in the north of Argentina or enjoying the delicious postres or desserts found all over Argentina, we make it a point to share our meals. Not only it helps with the ‘figure’, it also helps with the budget. 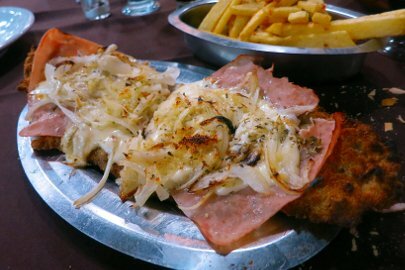 The good news is that in Argentina, the portion sizes are pretty generous, as we can see in our discovery of Milanesa at Don Ignacio, which makes it easy to share a meal. Often we will (depending on how hungry we are) order a starter (or two) and share the main meal. Dessert is not something that we order often, unless we are planning on making a special note of it on our site. 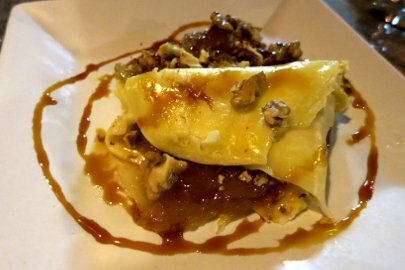 For example, Quesillo con Cajote is a speciality that is from the north of Argentina. It is made with cajote which is from the squash family and a flat cheese that is a combination of cow and goat milk. We had it a Khuska Restaurant in Tilcara and you can read here how Chef Ines talked about the preparation process. This dessert is delicious though rich and filling and one that we are glad to have shared. Keep this tip in mind whenever you are eating out and your body and your wallet will be thankful. In Argentina, taxis or remis (as they are called in Argentina) are everywhere and are pretty inexpensive. They are easy solution to rely on for getting around. In our efforts to stay healthy and make room for the food specialities, we often choose to walk instead. For example, in Cafayate where we recently stayed and discovered Torrentes and Tannat wines, we walked to the vineyards. The furthest vineyard we visited was Jose L. Mounier which was about 5km away in the mountains and for that visit, we took a remis and walked back by foot. Not only did we walk off the wine, we also enjoyed the beautiful scenery as well. Seriously though, choose to walk instead and enjoy the benefits of being fully present and noticing the little details you would miss otherwise. The best part is the keeping healthy and making room for the food. 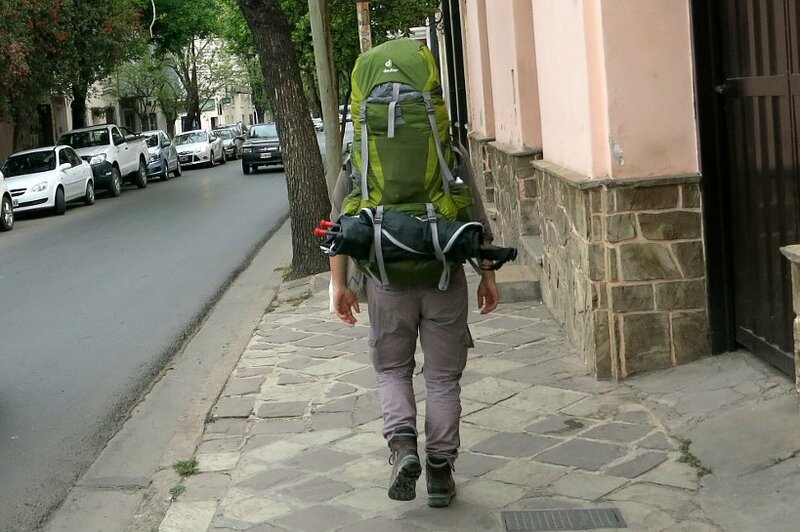 One of things that has surprised us about Argentina, is that people do not drink water when they are out and about. What you see instead is people drinking mate (a traditional drink) or drinking gaseosa (soda which is often Sprite or Coca-Cola) at restaurants, which come in huge 2 liters or 2.5 liters. Rarely do you see people order water at restaurants. This so surprising because Argentina has really delicious mineral waters that come from the Andes. Actually, one of our favorite activity is to research local mineral water. 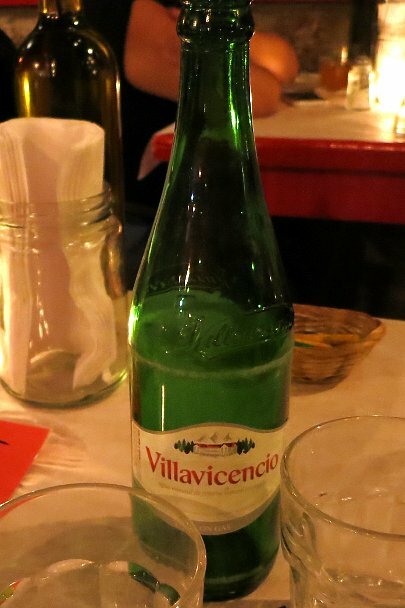 And the popular brands of mineral water that you will find in most places in Argentina are Villavicencio and Eco de los Andes (both from Mendoza). We love to discover the local mineral waters and even more so we drink tons of sparkling mineral water. We discovered by surprise that it is common in Argentina to have a glass of carbonated water or what is referred to as soda served with your coffee. This carbonated water or soda is also sold in 2.5 litre formats in stores. 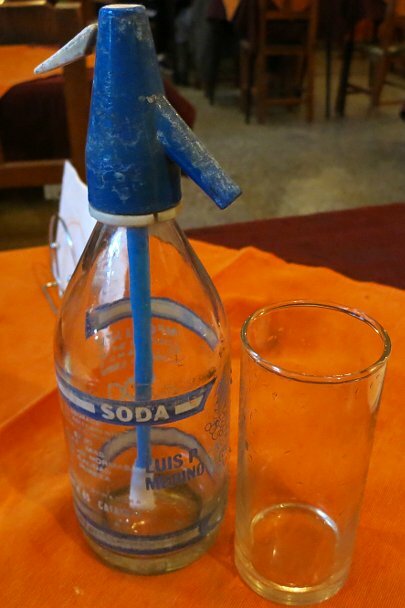 You can also find it at restaurants served in antique reusable bottles and in either case, you have a special nozzle that you need to press down and out comes fresh fizzy water. As you can see drinking water will help you get more cultural insights from the place you are visiting. To stay healthy make a point to drink the water that you enjoy and most importantly…drink more than you think you should! Having access to a kitchen has been a godsend on this travel adventure. We have chosen to stay at places that have kitchens so that we can cook our own meals for two primary reasons. First, it is the possibility to watch what we are eating while trying out local fresh produce. And as we posted previously, it is a way to get to know a place through its food stores. This opportunity to cook our own meals has given us a chance to try fresh and unique produce from the market. 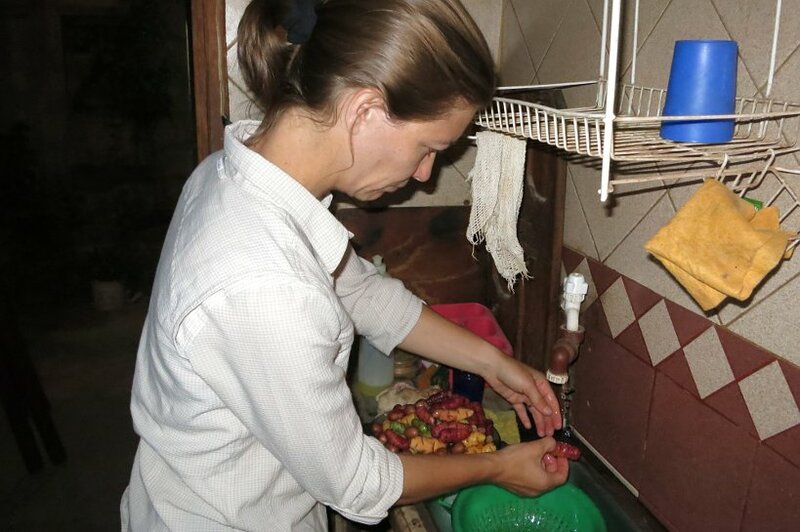 In this picture below, Claire is preparing papas andinas which are native potatoes found in the Salta region, in the North of Argentina. Secondly, cooking in a shared kitchen is a welcome opportunity to meet and get to know the people we are staying with. We’ve enjoyed some of the the most thought provoking conversations with locals over meals in a shared kitchen. Not only has this been a great way to eat healthy, but also to connect as well. Spend more time cooking in your kitchen and sharing meals with your loved ones. Use the food to deepen your relationships while managing to stay healthy. We love running and it is an easy way to keep fit. All we need are our running shoes, a running outfit and we are good to go. As mentioned earlier, Rosemary has been training for the marathon with Claire as her coach. One of the challenges on this travel adventure has been to find places to run, especially for the long runs which are typically over 1.5 hours long. 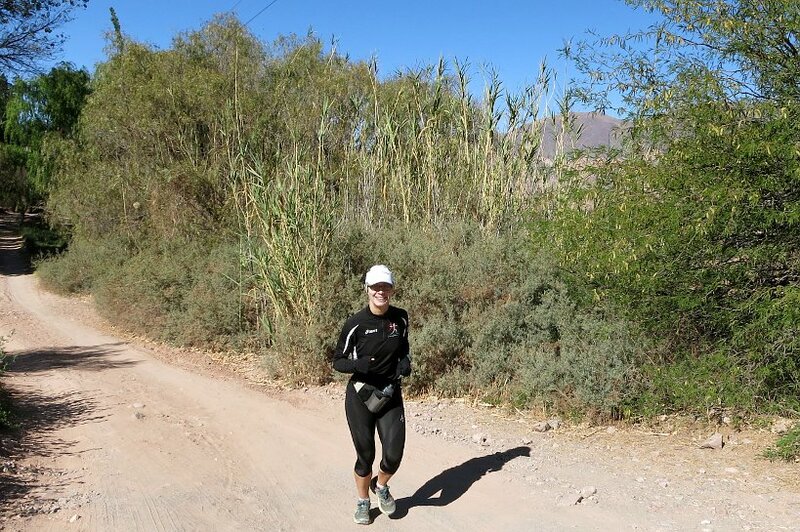 Claire will be talking about this in the next post on where to run in Argentina. Running is how we have chosen to keep fit and stay healthy on the road. It has also been a great way to discover the various cities and towns we have visited. Whatever sport you enjoy or however you choose to keep fit, you can always keep up with it on your travels. In Argentina we have seen yoga studios in the smallest and most unexpected cities, there are football (soccer) games taking place at every corner, you will find gyms in the various cities and the hiking in the natural beauty is amazing. Choose your sport and participate. On this note, let’s wish best of luck to Rosemary as she is getting ready to run the Buenos Aires marathon on Sunday, October 11th. 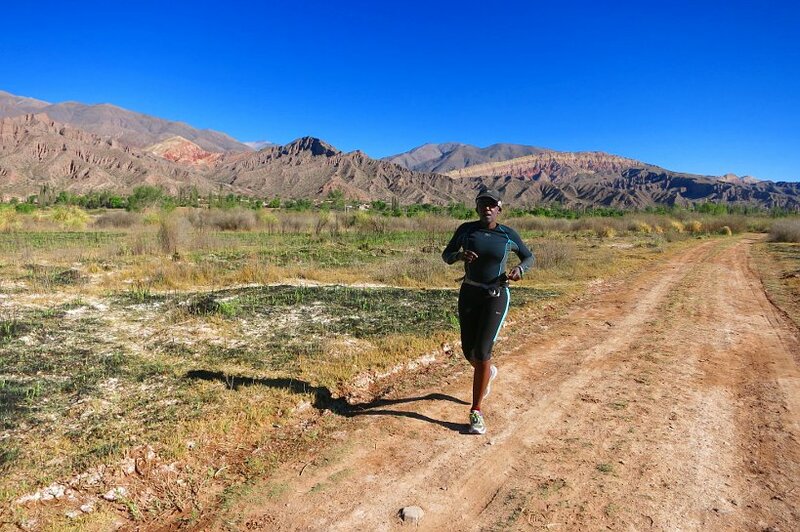 Our next post on Tuesday, we will provide more details on the places we have been running in Argentina while preparing for the marathon. Stay tuned to know how well Rosemary did and more importantly stay healthy! Honestly, you’re my hero! I find it so hard to eat healthy when I’m traveling . Especially to a new destination. I want to try all the new cuisine and then I end up struggling to stay on my exercise regimen. It’s probably because I’m just not dedicated enough! Thank you Marie! Yes, you are so right when it comes to wanting to try all the new cuisine. We try to stick to our routine which is to go exercise or running in the morning before breakfast. After a good exercise session, we can have a substantial breakfast with our usual healthy fruits and if we want we can try a few sweets from the local region as a treat. Also if we dine out the night before that gives us another excuse to go exercise to “wash it out”. Sharing meals (if possible) or taking small plates is best to try everything. What has kept us disciplined was to sign up for the marathon ahead of time. What might help is to sign up for an event (race, class, gym, …) during or after your travels. Feel free to reach out with anymore questions. It’s definitely not easy to stay in shape in Buenos Aires with all the red meat and wine! These are some useful tips for staying healthy while enjoying all there is to offer. If you’re in Buenos Aires, there are also quite a lot of English-speaking classes you can go to.